The film ‘Cemetery Junction' and the TV series ‘Ashes to Ashes' could inspire a revival of the cars from the Seventies and Eighties according to BCA. The motors of the Seventies and Eighties are set to star on the big and small screen in the next few weeks. The latest film from Ricky Gervais and Stephen Merchant, ‘Cemetery Junction', due for release on 14th April, will see some of the Seventies classics taking centre stage. And the new - and last - series of ‘Ashes to Ashes' will bring back memories of the cars of the Eighties including, of course, DCI Gene Hunt's Audi Quattro. Leading vehicle auction specialist, British Car Auctions (BCA) thinks the appearance of the cars of the Seventies and Eighties on the big and small screens will inspire a revival in interest in the cars from these decades. "Ever since ‘Life on Mars' reawakened interest in the cars of the Seventies, we have been seeing a steady demand for vehicles from this period," said Tim Naylor, PR Manager, BCA. "Although purists might hesitate to call some Seventies cars ‘classics', there are a number of clubs and associations dedicated to preserving vehicles from that era. It's not just the top-end exotica either; it's everything from family runabouts to the early ‘fleet' cars that interest collectors." Recent BCA sales have seen a wide choice of Seventies classics sold, including a 1979 Triumph Dolomite 1.9 HL, a 1973 Jaguar E-Type Series III Coupe, a 1979-registered MGB-GT and a 1976 Rolls-Royce Silver Shadow 6.7 litre saloon. 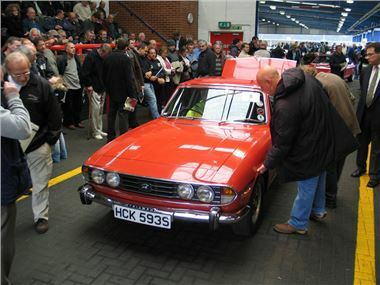 Naylor added "The best place to search is on the BCA website, where the online stock locator will quickly identify any older, quirkier cars that BCA has consigned for sale." "Enthusiasts looking for something to satisfy their nostalgia should also take a look at our Showroom facility on the BCA website" he continued. "The BCA Showroom regularly features the more specialist, classic and prestige vehicles ahead of them being sold, so it's a really good place to visit on a regular basis."